The Anik A satellites represent the first generation of a series of synchronous orbit communications satellites developed by Hughes Aircraft Company for individual nations to use within their territorial boundaries. Three Anik A satellites were built for Telesat Canada, a corporation created in 1969 by the Canadian Parliament to establish and operate a domestic satellite communications system within Canada. Anik A became the world's first national domestic satellite. Anik A-1 was launched from Cape Canaveral, Florida, aboard a Delta rocket 9 November 1972. Anik A-2 was launched 20 April 1973, and Anik A-3 was launched 7 May 1975. The satellites, designed to operate for 7 years, were retired after each served nearly 10 years. The satellites were part of the Hughes HS-333 generation of communications satellites built. This family of spacecraft was the forerunner of the popular Boeing 376 satellite line now in use around the world. Each Anik A was equipped with 12 transponders and had a capacity of 7000 telephone circuits or 12 color television channels. A new style "see-through" antenna covered by a fine gold mesh to minimize the tipping effect of solar pressure provided coverage in the C band frequency to all of Canada. 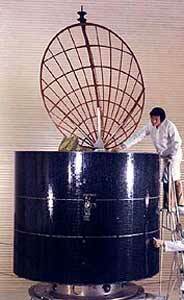 The parabolic antenna reflector was 5 feet (1.52 meters) in diameter. In orbit, Anik's antenna remained stationary and pointed toward earth as its cylindrical solar array spun at 100 revolutions per minute to provide gyroscopic stability and thermal control. Anik A showcased a new antenna technology--the shaped beam. Earlier communications satellites broadcast their signals to the entire globe, but the signal beam on Anik A was shaped only to cover Canada, the second largest country in the world. The beam covered St. John's, Newfoundland on the east to beyond Vancouver and the Alaskan border on the west, and from the U.S. border north to such remote communities as Resolute and Igloolik above the Arctic Circle. A total of 20,448 solar cells, each slightly more than 1/2 inch square, are attached to the cylindrical body of the satellite, which is 6 feet 3 inches (1.9 meters) in diameter and 5 feet (1.52 meters) high. The solar cells provided about 300 Watts dc power. The overall height of the satellite is 11 feet 2 inches (3.41 meters). Main body of the satellite consists of a thin-walled cylinder housing the spacecraft's solid propellant apogee motor (United Technology Center). The cylinder supports the satellite's electronics platform, which is 6 feet 1 inch (1.81 meters) in diameter. The platform contains the spacecraft's communications repeater, telemetry and command electronics, and batteries. At the center of the platform is a pedestal-type support and motor bearing assembly. The communications antenna is despun at a rate equivalent to the 100 rpm spin rate of the satellite. The communications repeater received signals from ground stations in the 6 GHz band and downconverted these to 4 GHz for retransmission to other stations. The antenna feed assembly consists of a three-horn aperture accommodating receive and transmit frequencies. Two omnidirectional antennas, a cloverleaf to receive commands and a bicone to send telemetry information, are mounted atop the parabolic reflector. Antenna despin is controlled by a signal processor, which comprises a directional antenna receive feed assembly, acting on a ground-generated pilot signal. The attitude of the spacecraft spin axis is determined on the ground by processing the telemetered sun and earth sensor pulses. Redundant, spinning vee-beam sun sensors determine the spin phase angle and sunline angle. The earth sensors are spinning infrared telescopes having a bolometer detector and a video amplifier. Two independent orbit and orientation hydrazine reaction control systems are carried aboard the satellite, each consisting of diametrically opposed titanium tanks, interconnecting gas and liquid lines, and two thrusters mounted inboard aft of the solar panel. The nozzle of one thruster is oriented to fire nearly parallel with the spin axis and is used for orbital inclination control when fired in a steady state, and for spacecraft orientation control when pulse-fired. The nozzle of the second thruster is oriented to fire through the satellite's average center of gravity. It is used only in the pulsed mode for orbital period and eccentricity control.